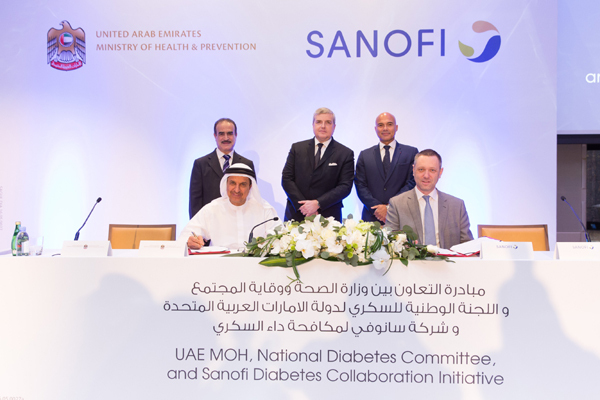 UAE’s Ministry of Health and Prevention has partnered with healthcare provider Sanofi for an initiative to improve physicians and nurses’ capabilities in providing standardised treatment for diabetes patients. The initiative also hopes to enhance prevention and awareness among healthy individuals in society for improved Type 2 diabetes management. Dr Hussain Abdul Rahman Al Rand, assistant undersecretary for health centres and clinics and chairman of the National Diabetes Committee added that the partnership is also aimed at imparting advanced training to healthcare professionals as part of the ministry’s initiative to combat non-communicable diseases, along with community awareness programs to achieve its strategic goals of enhancing healthy lifestyles within the country and limit lifestyle related diseases. He also indicated that the ministry is conducting many national surveys and research programmes to evaluate the incidence of diabetes and risk factors associated with it. One such programme is in progress by the Ministry of Health in collaboration with the University of Sharjah, Dubai Health Authority and the Health Authority of Abu Dhabi under the scientific supervision of Baker IDI Heart and Diabetes Institute. He also highlighted the importance of establishing surveillance systems and national patient records, in order create up-to-date databases that can contribute to drawing strategic plans, and monitor the progress achieved in combating diabetes through measurable indicators. The ‘Quality Improvement of Health Services’ initiative’s activities will provide accredited training programs on standardized diabetes treatment for healthcare professionals including, physicians and nurses to help them ensure improved health outcomes for diabetes patients. The ‘Empowerment of Diabetic Patients’ initiative will see educational workshops being conducted for diabetes patients and their families involving sessions and lectures by specialised experts along with interactive material developed especially to elevate patient understanding of diabetes.